I was planning on making these lemon blueberry muffins. I'm still searching for that ultimate muffin recipe that I can fall back on and am always guaranteed a great outcome. I used to make the Magnolia Bakery blueberry muffins, but find that they are always "wet" each and every single time I make them. Sometimes they turn out really chewy. I kept sticking to the recipe hoping that I can make it bake right. I guess that recipe just isn't for me. 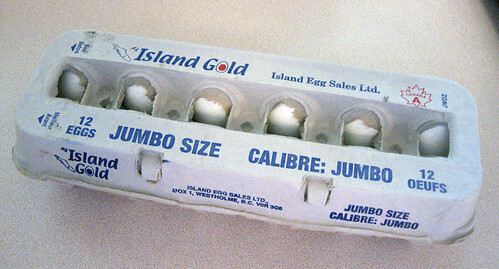 Yes, jumbo eggs. Brett couldn't wait to use them. I have never seen jumbo eggs before. Brett claims that they rarely sell them, so when he saw them at the store he couldn't resist buying them. I couldn't understand his extreme excitement over them until I opened the carton...holey moley!!! These bad boys were, well, JUMBO!! I couldn't believe my eyes when I saw their size!! I had to take pictures of them, they were that big! But the pictures weren't doing the size of the eggs any justice. 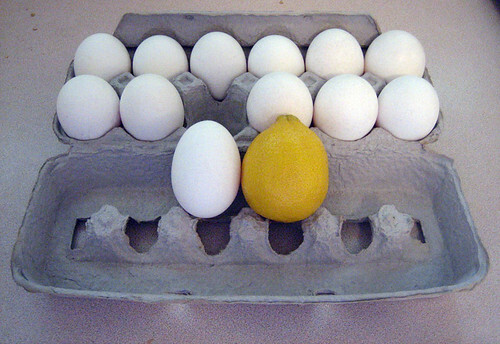 I rummages through my fridge and found a lemon. 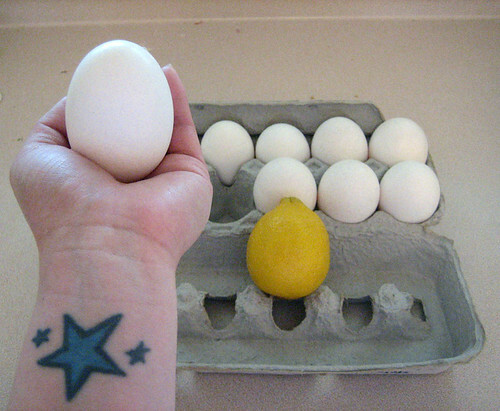 It was a fairly large lemon too, and the eggs were almost just as big! I think I stared and held the eggs for quite a while. I'm weird, I know. Brett thought it was funny. Unfortunately, after some Google-ing about using jumbo eggs in baking, I decided that I couldn't make my muffins with these behemoths in fear of royally screwing up the outcome. I'll try again the next time we get eggs...and this time, I'll be the one buying them!